45 year old Kirin Byath hails from a family of traditional dhakis (drummers). He learnt the art from his elder brother and has been playing the dhak since he was 25 years old. 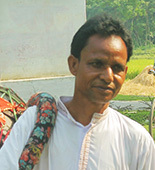 A seasonal cultivator, he mainly depends on the dhak as his primary source of income. His children however have stayed clear of the dhak and have no desire to learn.